It was a massive structure built with large limestone blocks and had a total length of 607 feet. The average level of its crest was 27.7OD. Falling boards, some 15in in depth, were provided for a length of 190 feet. The weir was also provided with two 10ft sluice gates between large masonry pillars which were operated by hand. A fish pass was constructed consisting of a series of pools, forming a ladder, with an outlet two feet wide at the upstream end. A smolt pass was provided at the downstream end of the pier. Almost all of this work was done between May and October of 1852. Among the other constructions carried out about this time were the Claddagh Basin, the Eglinton Canal, O’Brien’s Bridge, all the millraces, and the Friar’s Cut. 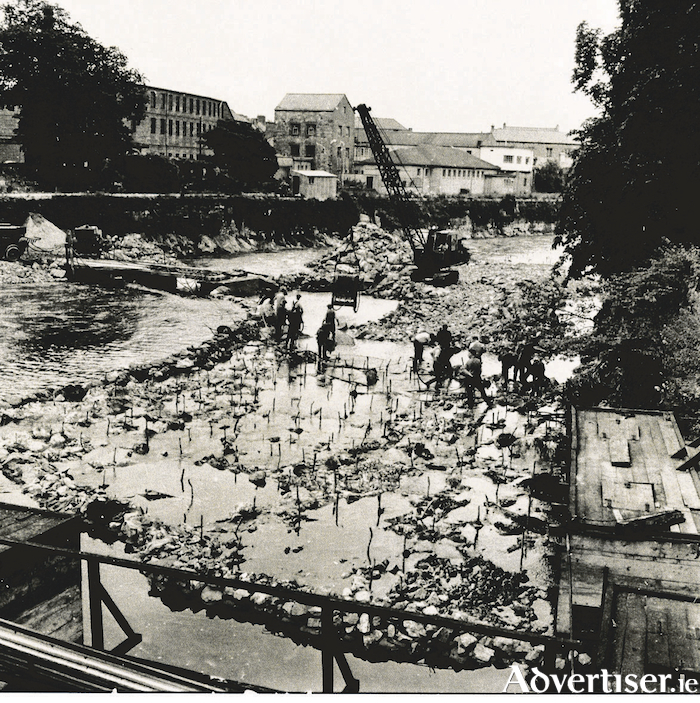 The results of this scheme were not altogether successful as some areas in the lower reaches of the river were found to suffer from prolonged flooding, so it was decided to draw up plans for a scheme known as the Corrib-Clare Drainage Scheme. Its main elements were the excavation of the Galway River channel from the head of the Eglinton Canal to approximately halfway between the O’Brien and Wolfe Tone bridges, and the construction of a new weir just north of the old weir. The survey of the arterial drainage area of 780,000 acres had to be meticulous and took a long time. The actual dredging started in the early 1950s and went on for most of the decade. As you can see from our photograph, they had to keep diverting the course of the river to allow cranes and diggers to work on the river bed. They lowered the river bed by an average of three feet. While the process was very successful, the length of time it took meant that the number of salmon going upriver was greatly reduced. Our photograph of the scheme was taken from the Salmon Weir Bridge in the mid 1950s, looking towards Newtownsmyth.